Group exhibition Spieltrieb at Jack Hanley Gallery, New York. 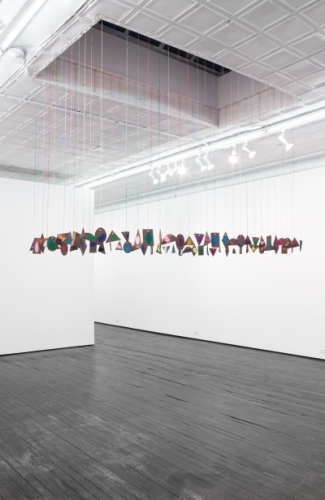 Polly Apfelbaum’s installation of suspended terra-cotta shapes colored with textile spray is based on the American tradition of the seven-shape note system. The shape notes, a musical notation system developed in the beginning of the 19th century, has commonly been used in music schools to facilitate music notations through visual associations. Her accompanying wall-bound mount holding paint brushes with terra-cotta beads further convey the viewer’s synesthesia within an entanglement of sound, color, and shapes.